The Space Science Institute (SSI), home to the STAR Library Network (STAR Net) and its NASA @ My Library program, invites professional and amateur astronomers, museum educators, and science teachers to collaborate with libraries in their communities this summer to celebrate the 50th anniversary of the Apollo 11 Moon landing. 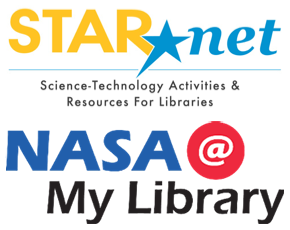 The STAR Net team, in partnership with the Collaborative Summer Library Program (CSLP) and NASA, are working to share science- and technology-related activities and resources with 16,000 libraries across the nation as part of an initiative called Summer of Space. The slogan "A Universe of Stories" was chosen by CSLP members to inspire children of all ages to dream big, believe in themselves, and create their own story. This is an ideal time to engage the public in learning about space exploration and the achievements that we have made in understanding how our universe works. Astronomers, planetary scientists, and other subject-matter experts are invited to collaborate with their local library to make this a memorable event that can rival the successful 2017 solar eclipse. For the eclipse, STAR Net staff distributed 2.1 million solar viewing glasses to 7,100 organizations, including public library branches, bookmobiles, tribal libraries, library consortia, and state libraries. A similar reach is expected for Summer of Space. STAR Net's Summer of Space resource portal includes a link to the Universe of Stories collection on STAR Net's STEM Activity Clearinghouse, a website where librarians and library staff can find high quality, vetted STEM (science, technology, engineering, and mathematics) activities that are appropriate for library use. To date, more than 3,300 libraries have registered on the site to receive important news and resource notifications. STAR Net has created a map on its Summer of Space webpage that shows where registered libraries are located in all 50 states. This map serves as an important resource for libraries to collaborate with each other and for astronomers and other STEM partners to find libraries with which they can collaborate. The site also includes a comprehensive collection of resources that includes collaboration opportunities, printable materials, promotional materials, inspirational items, and many other resources that libraries can utilize to make their 2019 summer learning program a great success. Libraries that register are eligible for many types of giveaways such as Getting a Feel for Lunar Craters, a NASA-funded Braille book (2,000 copies), and a series of science books donated by Scholastic (800 copies). They also have a chance to win 4 free Orion StarBlast telescopes. Libraries across the country have been reimagining their role to strengthen community-based learning and foster critical thinking, problem solving, and engagement in science, technology, engineering, and math. Public libraries, which serve people of all races, ages, and socio-economic backgrounds, are becoming "on-ramps" to STEM learning — but they need help from local scientists and science enthusiasts, so please consider lending your expertise and energy to your community's public library during the Summer of Space!